It’s hard to go a day without seeing an article about the Common Core standards (www.corestandards.org). The final standards—released in June 2010— have been adopted by all states except Nebraska, Minnesota, Texas, Alaska, and Virginia. But what does this mean in terms of technology? Will schools need to toss out their interactive whiteboards? Will 1:1 and BYOD be superfluous? Tech & Learning (T&L) editors spoke with industry experts to get insight about how technology will be used to both leverage and manage the delivery of curriculum that meets Common Core standards. Here’s what they had to say. Joel Rose is CEO of New Classrooms Innovation Partners (www.newclassrooms.org), a non-profit organization that helps schools create adaptive, personalized learning models designed to support every student’s success. T&L: What is the purpose of the Common Core standards? Rose: The standards redefine what we want kids to be able to do and give schools the opportunity to determine how we get them there. They allow us to think differently about how we can complement the role of the teacher with other approaches that can work toward that same common end. We know that students come to school with a wide variety of strengths and needs, and the standards are more rigorous than what we’ve seen in the past. T&L: Where does technology come in? Rose: The only real way to meet the needs of every student against these standards is to think about complementing the role of teachers with technology. From my perspective, it’s exciting that this is less about technology and more about the opportunity to design next-generation learning models that may use technology in different ways. Today, school equals 1 teacher + 28 kids + a textbook. There are other ways we can imagine and put into practice that can be more effective and engaging than the current model. We have to think more creatively about all of the resources we have and develop new models that leverage the talents of teachers and the power of technology. 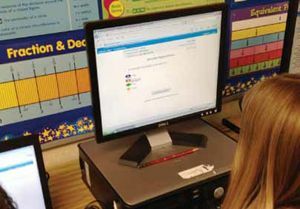 Students and educators are getting used to taking tests online. T&L: Do you think research and understanding how children learn helped us get to this point? Now that we have a common definition of success, and given what we know about teachers, technology, physical space, and time—what are the best ways to put these ingredients together to get the best outcomes for students? T&L: What role will technology play? Rose: New Classrooms, which I co-founded, has a model called Teach to One that blends live teacher-led instruction, collaborative instruction, and virtual ins truction to enable personalized learning. We use technology in two ways to complement the work of teachers: to deliver instruction with software or virtual tutors as well as to organize student and teacher schedules . In the traditional model, it’ s generally too hard for a teacher to plan the right instruction every day for every child, based on what he or she mastered the previous day. Teachers typically follow a scope and sequence and teach to the middle while doing their best for students at the high and low ends. Our model uses technology to take all the data we have about each child every day. Then we convert it to a unique daily schedule for each student and teacher. T&L: How can teachers prepare for this? Rose: A number of teachers have perfected lessons or have grown accustomed to teaching in a certain way. The Common Core standards require them to take a step back and reassess the objectives of those lessons to make sure they’re teaching to the standards. I’d encourage teachers—as long as they ar e rethinking the objectives in their lessons—to use that window to think differently about the ways in which they could leverage different technology to those s ame ends. It’s an opportunity to de velop new models and not just grasp technology for technology’s sake. T&L: What role will technology play in assessment with the Common Core standards? Rose: Technology can help take a lot off teachers’ plates, particularly in designing, delivering, and grading assessments. If technology gets better at diagnosing individual student misconceptions, it will be a critical tool for helping teachers to understand and pinpoint where a student most needs help. How Much Time Do Educators Spend on Assessment? In December 2011, Lexia Learning conducted a survey of more than 7,600 K-12 educators to estimate the amount of time they spent administering, scoring, entering, and analyzing data for four types of assessments: universal screening, progress monitoring, diagnosing, and evaluating outcomes. 20 days: The average amount of time K–5 educators focus on assessing reading skills. 1/3: The number of K–5 educators in this survey who spend at least 1.5 months per school year assessing their students’ reading skills. 8: The average number of days students take reading tests each year. 1 in 3: The number of students who spend at least two weeks per year taking reading assessments.